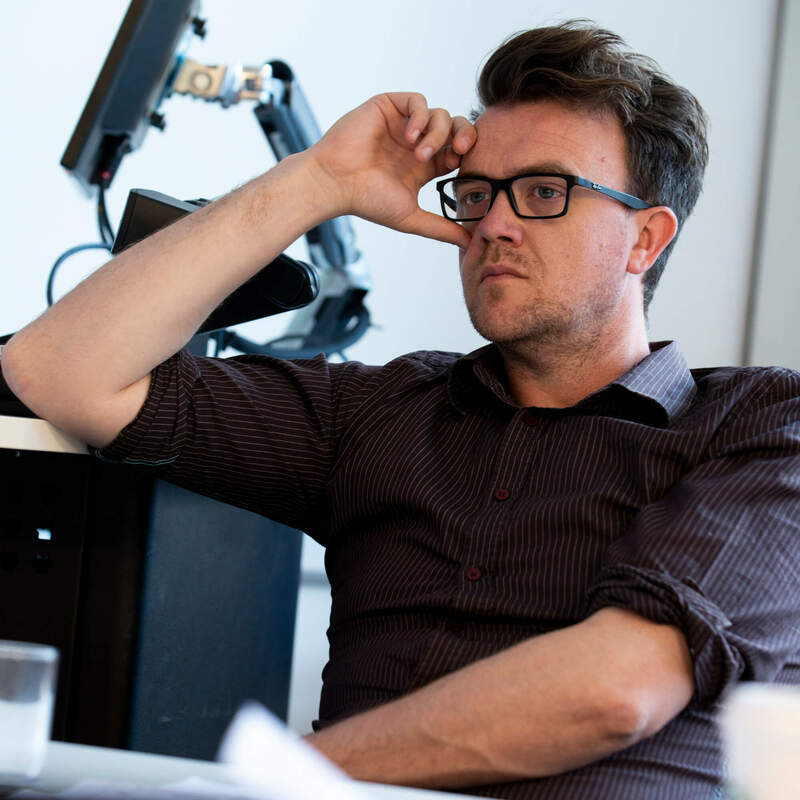 I am Programme Leader and Senior Lecturer in Design with specialisms in Motion Graphics, Animation and Moving Image. I teach into the following programmes: BA (Hons) Animation, BA (Hons) 3D Animation, BA (Hons) Graphic Design, BA (Hons) Illustration both as module leader and core teaching team. My background is in 2D and 3D Motion Graphic Design and video post-production and I've contributed to projects such as music videos and produced titles for films such as The Gloaming, directed by independent film makers John Bradburn and Andrew Paton and funded by Screen West Midlands. I've contributed to all three issues of The Observatory publication, submitting work entitled 'Beige', 'Vermillion Border' and '172 Tangerine'. I also have an active interest in moving image and motion graphics and I'm currently investigating ways to use new technologies to move animation and motion graphics off traditional formats such as TV screens and computer monitors. I am interested in experimental techniques in creating moving image, 3D projection mapping and geometric and mathematical pattern. I am a member of the Design and Visual Communication research group at the University of Derby. Currently, this research focuses on using traditional animation techniques with new techniques such as video projection mapping, which can turn virtually any surface into a dynamic video display. I've also been involved in recent projects where some of these techniques have been utilised in live theatre, where animation has augmented the performances on stage, and in promotional installations. I intend to further this research to incorporate interaction from the viewer or performer, which in turn will manipulate graphic and audio elements in real time. Collaboration with animator Marc Bosward and musicians Michael Brown and Phil Baggaley. A creative work forming part of collaborative research, intended to be disseminated as an installation with supporting academic paper. We wanted to explore the dynamics of multidisciplinary collaboration, observing and recording the exchanges and expressive negotiations between composers and animators, to produce an immersive expressive design. Ultimately, the eventual objective was to explore an element of audience interactivity. Ostensibly, the work is an exploration of the contemplative reflection of loss and eventual resolution through evocation of memories of familiar places and interactions with nature. The piece was first presented as part of the Sounds in Space Symposium at the University of Derby. It had further screenings at the Nature Connections Festival 2015 University of Derby and featured on BBC Autumn Watch Extra in November 2015. Screened at Leeds College of Music February 2016. Forge was an animation projection that was shown as part of Charles Monkhouse’s Derwent Pulse event at Darley Abbey. It was made with my University of Derby colleagues Tim Shore and Marc Bosward. Derby QUAD provided the projection and the PA system. We were approached by the Darley Abbey Society, after they saw our previous projection piece at Strutt’s North Mill Belper, to make a short animation work which was looped and projected onto the faces of the grade-one-listed Long Mill (1782-89) and the adjoining West Mill (1819-21). Tim, Marc and I each made short animation sequences, with a soundtrack by Marc. The animation references the history of water, power, fire and rebuilding that characterises the history of the site. A projection-mapped interactive installation for the Four Three Six record label launch at Derby QUAD. Working in collaboartion with John Bradburn, Programme Leader for Film at the University of Worcestershire, I produced 3D Animation and Post Production work on Opium Lord's Black Libraries music video. Screened at noisey.vice.com. Ingestre Hall is a Residential Arts centre in rural Staffordshire. Ingestre Arts was awarded funding from the National Lottery Celebrate fund to stage a community event. The Door to Door festival was a free community event featuring a variety of performers and arts activities available in the hall throughout the day. The last performance of the day featured dance and acting that was set to the backdrop of the hall and a series of animation and film projects that accompanied the drama. I collaborated in the production of an interactive film installation displayed at the popular London attraction. The interactive film starred Jenny Agutter and questioned the moral compass of those that viewed it using the story of Frankenstein’s monster as the inspiration for this contemporary interpretation. As part of the Derby Feste, QUAD was be lit up with a series of large format projections to celebrate 10 years of Derby QUAD. This was a tutor-led project with input from many students from the College of Arts. Contributor to 'Beige', 'Vermillion' and 'Tangerine', published by The Observatory, an imprint of the Visual Communication Research Group.